COOL TOOLS for Spring Organizing! 30 banker’s boxes are the minimum for a home. We use them to sort, contain and move the piles, stage the stuff during large projects, and free our clients from the distraction of all the stuff. A labeler is essential. Having your containers and shelves labeled not only makes it easy to find what you need but mostly makes it easier to put things back where they belong. We recommend the Brother PTouch. Our Resource Page has all our favorites that will help you even more! Happy Spring Cleaning, Clearing & Organizing! Transform a closet, cupboard or drawer! How would it feel if your closet looked like this? Quick Tip – Choose just ONE closet, cupboard and drawer for a spring make over! How much easier would life be if all the items in your cupboards were contained? How about your bedside table? What a difference it makes when you use drawer organizers! Start with asking which cupboard, closet or drawer am I ready to tackle? Then ask what would make it feel FABULOUS and give yourself permission to do just this ONE! Watch this month as we share our TOP TEN TIPS for Spring! 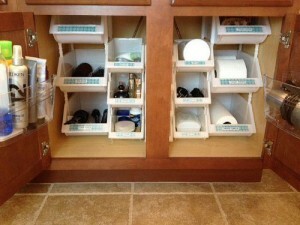 We’ll share the latest & greatest container ideas as well as organizing tips to clear clutter and organize these areas. Why not try The clear & SIMPLE Way! Get our TOP TEN Organizing Tips for Spring! Spring is just around the corner! Are you ready for freedom & fun? Tip #5. Choose containers that you LOVE for the areas and stuff you use the most! One that we love is the Feathergrain Wood Bin from The Container Store. It’s pretty, sturdy and functional. 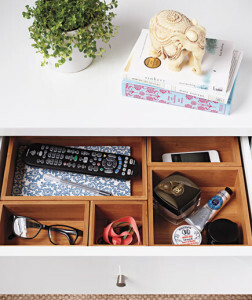 Use it in deep cupboards as a make-shift drawer, or in closets to organize items from toiletries to office supplies. Since they are lightweight you can easily move them about the house, like for toys or art supplies. Get the rest of our top tips from Marla who will be speaking ONLY once each day, so mark your calendars! Friday March 6th @ 2 p.m.
Saturday March 7th @ 10 a.m.
Sunday March 8th @ 11 a.m.
Visit our Booth #2743, near the Design Stage, for Expert Tips and to enter our drawing! You can also Purchase Discount Tickets. Friday March 6th @ 12:00 p.m. through Sunday March 8th @ 6:00 p.m.